This article is about the city in Zimbabwe. For the royal kraal of the Zulu empire, see Bulawayo (Zulu empire). View of Bulawayo's Central Business District (CBD) from Pioneer House by Prince Phumulani Nyoni. The CBD is 5.4 square kilometres and is in a grid pattern with 17 avenues and 11 streets. Bulawayo (Ndebele: koBulawayo) is the second largest city in Zimbabwe, and the largest city in the country's Matabeleland. 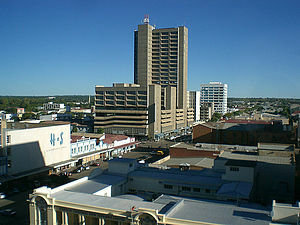 The city's population is disputed; the 2012 census listed it at 653,337, while the Bulawayo City Council claimed it to be about 1.2 million. Bulawayo covers an area of about 1,707 square kilometres (659 sq mi) in the western part of the country, along the Matsh' Amhlope River. Along with the capital Harare, Bulawayo is one of two cities in Zimbabwe that are also a province. Bulawayo was founded around 1840 as the kraal of Mzilikazi, the Ndebele king. His son, Lobengula, succeeded him in the 1860s, and ruled from Bulawayo until 1893, when the settlement was captured by British South Africa Company soldiers during the First Matabele War. That year, the first white settlers arrived and rebuilt the town. The town was besieged by Ndebele warriors during the Second Matabele War. Bulawayo attained municipality status in 1897, and city status in 1943. Bulawayo is, at least historically, the principal industrial centre of Zimbabwe; its factories produce cars and car products, building materials, electronic products, textiles, furniture, and food products. Bulawayo is also the hub of Zimbabwe's rail network and the headquarters of the National Railways of Zimbabwe.In recent years, the city's economy has struggled as many factories either closed or moved operations to Harare. Still, Bulawayo has the highest Human Development Index in the country, at .649 as of 2017. Bulawayo's central business district (CBD) covers 5.4 square kilometres (2.1 sq mi) in the heart of the city, and is surrounded by numerous suburbs towards the outskirts. The majority of the city's population belong to the Ndebele people, with minorities of Shona and other groups. Bulawayo is home to over a dozen colleges and universities, most notably the National University of Science and Technology. The Natural History Museum of Zimbabwe, formerly the National Museum, is located in Bulawayo, and the city is in close proximity to popular tourist sites like Matobo National Park and the Khami Ruins, and World Heritage Site. The city was founded by the Ndebele king, Lobhengula, the son of King Mzilikazi born of Matshobana who settled in modern-day Zimbabwe around the 1840s after the Ndebele people's great trek from Nguniland. The name Bulawayo comes from the Ndebele word KoBulawayo meaning "a place where he is being killed". It is thought that, at the time of the formation of the city, there was a civil war. A group of Ndebeles not aligned to Prince Lobengula were fighting him as they felt he was not the heir to the throne, hence he gave his capital the name "where he (the prince) is being killed". It is said that when King Lobengula named the place "KoBulawayo" his generals asked "who is being killed mtanenkosi (prince)?" and he replied "Yimi umntwanenkosi engibulawayo", meaning "it's me, the prince, who is being killed". At the time Lobengula was a prince fighting to ascend his father's (Mzilikazi) throne. It was common at the time for people to refer to Bulawayo as "KoBulawayo UmntwaneNkosi" "a place where they are fighting or rising against the prince". The name Bulawayo is imported from Nguniland which was once occupied by the Khumalo people. The place still exists: It is next to Richards Bay. In the 1860s the city was further influenced by European intrigue, and many colonial powers cast covetous eyes on Bulawayo and the land surrounding it. Britain made skillful use of private initiative in the shape of Cecil Rhodes and the Chartered Company to disarm the suspicion of her rivals. Lobengula once described Britain as a chameleon and himself as the fly. During the 1893 Matabele War, the invasion by British South Africa Company troops forced King Lobengula to evacuate his followers, after first detonating munitions and setting fire to the town. BSAC troops and white settlers occupied the ruins. On 4 November 1893, Leander Starr Jameson declared Bulawayo a settlement under the rule of the British South Africa Company. Cecil Rhodes ordained that the new settlement be founded on the ruins of Lobengula's royal kraal, which is where the State House stands today. In 1897, the new town of Bulawayo acquired the status of municipality, and Lt. Col. Harry White became one of the first mayors. At the outbreak of the Second Matabele War, in March 1896, Bulawayo was besieged by Ndebele forces, and a laager was established there for defensive purposes. The Ndebele had experienced the brutal effectiveness of the British Maxim guns in the First Matabele War, so they never mounted a significant attack against Bulawayo, even though over 10,000 Ndebele warriors could be seen near the town. Rather than wait passively, the settlers mounted patrols, called the Bulawayo Field Force, under Frederick Selous and Frederick Russell Burnham. These patrols rode out to rescue any surviving settlers in the countryside and attacked the Ndebele. In the first week of fighting, 20 men of the Bulawayo Field Force were killed and 50 were wounded. An unknown number of Ndebele were killed and wounded. During the siege, conditions in Bulawayo quickly deteriorated. By day, settlers could go to homes and buildings in the town, but at night they were forced to seek shelter in the much smaller laager. Nearly 1,000 women and children were crowded into the small area and false alarms of attacks were common. The Ndebele made a critical error during the siege in neglecting to cut the telegraph lines connecting Bulawayo to Mafikeng. This gave the besieged Bulawayo Field Force and the British relief forces, coming from Salisbury and Fort Victoria (now Harare and Masvingo respectively) 300 miles to the north, and from Kimberley and Mafeking 600 miles to the south, far more information than they would otherwise have had. Once the relief forces arrived in late May 1896, the siege was broken and an estimated 50,000 Ndebele retreated into their stronghold, the Matobo Hills near Bulawayo. Not until October 1896 would the Ndebele finally lay down their arms to the invaders. In 1943, Bulawayo received city status. In recent years, Bulawayo has experienced a sharp fall in living standards coinciding with the severe economic crisis affecting the country. The main problems include poor investment, reluctance by government to improve infrastructure and corruption and nepotism leading to most original dwellers of the city migrating south to the neighbouring South Africa. Water shortages due to lack of expansion in facilities and supplies have become steadily more acute since 1992. Cholera broke out in 2008. Though the city is the centre of the southern population generally categorized as the Matebele, the composition of the city is made up of people from all over the country. The Central Business District has the widest roads which were deliberately made so to accommodate the carts that were used as a primary means of transport back when the town was planned and erected. Bulawayo is nicknamed the "City of Kings" or "kontuthu ziyathunqa"—a Ndebele phrase for "smoke arising". This name arose from the city's historically large industrial base and specifically draws from the large cooling towers of the coal powered electricity generating plant situated in the city centre that once used to billow steam and smoke over the city. The majority of Bulawayo's population belongs to the Ndebele ethnic and language group (otherwise known as Northern Ndebele). 2 Barbourfields The suburb was named after a former mayor, H. R. Barbour, who during the colonial era was greatly interested in the welfare of the indigenous people. There is a place called Barbour in Argyll & Bute. Barbour is a Scottish family name, though it was apparently first recorded on the English side of the border, in Cumberland and Northumberland. The father of Scottish vernacular poetry, John Barbour (1320–1395), is best remembered for his epic poem "The Brus", telling the story of King Robert I. The origin of the name is occupational (a cutter of hair as well as an extractor of teeth during the Middle Ages). 3 Barham Green The suburb was named after two people. The first was a former Bulawayo City Councillor (who later became an Alderman) Mrs. M. E. Barham, M.B.E. and the other was Rev. Rufus Green. They were critical in the establishment of this suburb. During the colonial Rhodesia era, it was designated for the Coloured community. 4 Beacon Hill Also known as Beryl Drive, reference is made to fact that it is the high point of the suburbs and possesses the areas with the highest marking beacon at its summit. 5 Bellevue The suburb was named after the estate name. It is sometimes spelled Belle Vue. The origin of this universally popular place name is ultimately French – "beautiful view". 7 Belmont Industrial Area The area was named after a former Bulawayo City Engineer, Mr. Kinmont. 8 Bradfield The suburb was named after Edwin Eugene Bradfield, a pioneer. 9 Burnside This area used to be a portion of former town council area and used to be part of Matsheumhlope Farms. The name is derived from the reference to the River Matsheumhlophe. "Burn" is a Scottish and northern English word for a stream. 10 Cement This was named after the surrounding industrial area, responsible for the making of cement. 14 Douglasdale The Douglas family, descendants of William de Douglas (late 12th century), was one of the most powerful in Scotland. 16 Emakhandeni Emakhandeni is the isiNdebele name for Fort Rixon, which was the area where the regiment aMakhanda were located. eMakhandeni is the locative term. 17 Emganwini Reference is made to the plentiful amarula trees in the vicinity. 20 Entumbane This is where King Mzilikazi was buried. It is one of the dozens of high-density suburbs of Bulawayo, commonly referred to as the "Western Suburbs". The first disturbances that led to the Gukurahundi were sparked in Entumbane, hence the term "Impi ye Ntumbane" that refers to the disturbances. 22 Famona The suburb was named after Famona, one of the daughters of King Lobengula. It means jealousy or envy must end (literally, "die"). 23 Fortunes Gate (including Mtaba Moya) The suburb's name comes from the original property name, and the gates are those of the original market building. 24 Four Winds The suburb name comes from the original property name; the first house was on top of a hill. 25 Glencoe This name is etched into the Scottish psyche as the bleak glen in the Highlands where, in 1692, a party of MacDonald men, women, and children were treacherously massacred by the Campbells, who were acting under government orders. 26 Glengary The suburb was named after its estate name. The "Glengarry" bonnet is an oblong woollen cap, popular amongst pipe bands. 27 Glenville (including Richmond South) The suburb was named after its estate name. 29 Greenhill The suburb's name is a reference to scenery and topography. 30 Gwabalanda Named after a Ndebele chief, Gwabalanda Mathe. 34 Hillcrest The suburb's name comes from the reference to topography. It is Greenhill's crest. 35 Hillside The suburb's name is a reference to topography (Greenhill's slope). 36 Hillside South The suburb's name comes from its position as the south facing slope of Greenhill. 37 Hume Park "Hume"/"Home" is a Lowland Scottish family name. 38 Hyde Park The name originates from the large number of residents who trace their ancestry to England. 40 Iminyela This is the name of a type of tree common in the area. 41 Intini The name was given as a commemoration to the Mhlanga family, who originally set out with the Khumalo family under Mzilikazi as gratitude to their contribution to the Ndebele Kingdom, Mthwakazi. The Ntini is the totem of the Mhlanga-Mabuya clan. 42 Jacaranda This is a reference to the jacaranda trees. 43 Kelvin (Industrial area, includes North East and West) The area was named in reference to a suburb of Glasgow. It takes its name from the River Kelvin, a tributary of the River Clyde. 44 Kenilworth The suburb was named after its estate name. 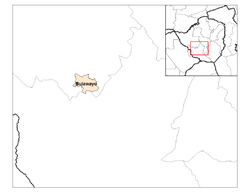 45 Khumalo The suburb was named after the Royal Clan of the Matabele. The Khumalo hockey stadium is here. 46 Khumalo North This is a reference to the position of Kumalo suburb. 50 Lakeside Lakeside is the stretch of water at the junction of the Old Essexvale Road and the road to the suburb of Waterford, and then on to Hope Fountain Mission. 51 Lobhengula It is named after the second and last Matabele King, Lobengula. 52 Lobenvale The suburb's name is derived from a combination of King Lobengula's name and Umguza Valley. 53 Lochview The suburb's name is in reference to Lakeside Dam and is famous in the city for its large Scottish residents and the Scottish style houses. According to the Bulawayo City Suburb Names website, the suburb was named in reference to Lakeside Dam. 55 Mabuthweni The suburb's name means "where the soldiers are"; the name was given in reference to a bachelors' quarters. 56 Magwegwe The suburb name is named after Magwegwe, who was one of the significant people in King Lobengula's royal Bulawayo town. 57 Magwegwe North This is a reference to the position relative to that of Magwegwe. 58 Magwegwe West This is a reference to the position relative to that of Magwegwe. 59 Mahatshula Mahatshula is named after one of the Ndebele Indunas, Mahatshula Ndiweni. 60 Makhokhoba The suburb got its name from the actions of Mr. Fallon, who used walk around with a stick. The name comes from the word "umakhokhoba" which was how the locals referred to Fallon, meaning "the little old man who walks with a stick". The word actually describes the noise of the stick hitting the ground, ko-ko-ko, or the doors. It is the oldest African dwelling in the city. Political activism was rife in the pre-ZAPU era. 61 Malindela The suburb was named after the mother of Faluta, who was the mother of Lobengula, i.e., after Lobengula's maternal grandmother. 62 Manningdale It is named after the developer of the suburb. 64 Matsheumhlope The name comes from the association with the river ("White Stones"). White stones in Ndebele Proper and Zulu language are "amatshe amhlope". 65 Matshobana The suburb was named after Matshobana, who was a chief of the Khumalo clan and more significantly he was the father of Mzilikazi, the founder of the Ndebele Kingdom. 66 Montgomery It is named after Bernard Montgomery, 1st Viscount Montgomery of Alamein, a decorated British Army commander. 67 Montrose The suburb was named by the estate developers, and street names are of many Cotswolds villages and towns. 69 Mphophoma The name comes from a descriptive Ndebele name for the area, which was derived from the sound the Mpopoma River makes when flowing. 71 Mzilikazi The suburb was named after the founder of uMthwakazi, King Mzilikazi. It is a stone's throw away from Barbourfields suburb, separated by a road called Ambulance Drive that leads to one of Zimbabwe's large hospitals, Mpilo. 72 New Luveve Reference is made to the suburb Luveve; see Luveve suburb. 78 Nketa It is named after the traditional heritage site of Nketa Hill on which King Lobengula assembled his entire kingdom and divided its citizens according to cultural ethnicity and stages of incorporation into three groups: the Zansi which is Xhosa for "south", referring to the people who left the Zulu Kingdom originally; the Enhla or Nxele, which referred to the second mass incorporated group, which was the Swati, Pedi, and Sotho, with whom they settled in Mhlahlandela 1; the final group was the Hole /ˈxɒli, which constituted of the Shona, Kalanga and Bakwena. Most historians argued that this was clear evidence of Lobengula's lack of foresight and political tact as he was literally undoing what his father had spent his lifetime trying to achieve: a unified kingdom with a single identity. 90 Phelandaba Phelandaba translates as "the matter is concluded", a reference to the successful conclusion to the struggle for security. 91 Phumula Phumula means "a resting place", reference to the fact that many have built homes there to retire to. 97 Rangemore The suburb adopted the original estate name. 98 Raylton The suburb adopted the original estate name. 101 Romney Park The suburb was named after George Romney, a British painter. 106 Souththwold The suburb was named by the estate developers, and street names are of many Cotswolds villages and towns. 108 Suburbs This was the first suburb in Bulawayo and retained that name. The suburb has many tree-lined avenues and is where the Centenary Park, Natural History Museum and the Bulawayo Athletic Club are found. 111 Tegela The name is derived from a Ndebele word ukwethekela meaning "to visit". 113 Thorngrove The suburb's name came from the large number of mimosa (thorn) trees in the area. 115 Tshabalala This is the "isibongo" or praise name for Lobengula's mother, Fulata, who was of Swazi extraction. Retained the old estate name. The city sits on a plain that marks the Highveld of Zimbabwe and is close to the watershed between the Zambezi and Limpopo drainage basins. The land slopes gently downwards to the north and northwest. The southern side is hillier, and the land becomes more broken in the direction of the Matobo Hills to the south. Due to its relatively high altitude, the city has a subtropical climate despite lying in the tropics. Under the Köppen climate classification, Bulawayo features a semiarid climate (BSh). The mean annual temperature is 19.16 °C (66.44 °F), similar to Pretoria at a similar altitude but almost 600 km (373 mi) farther north. As with much of southern and eastern Zimbabwe, Bulawayo is cooled by a prevailing southeasterly airflow most of the year and experiences three broad seasons: a dry, cool winter season from May to August; a hot dry period in early summer from late August to early November; and a warm wet period in the rest of the summer, early November to April. The hottest month is October, which is usually the height of the dry season. The average maximum temperature ranges from 21 °C (70 °F) in July to 30 °C (86 °F) in October. During the rainy season, daytime maxima are around 26 °C (79 °F). Nights are always cool, ranging from 8 °C (46 °F) in July to 16 °C (61 °F) in January. The city's average annual rainfall is 594 mm (23 in), which supports a natural vegetation of open woodland, dominated by Combretum and Terminalia trees. Most rain falls in the December to February period, while June to August is usually rainless. Being close to the Kalahari Desert, Bulawayo is vulnerable to droughts and rainfall tends to vary sharply from one year to another. In 1978, 888 mm (35 in) of rain fell in the three months up to February (February 1944 is the wettest month on record with 368mm) while in the three months ending February 1983, only 84 mm (3 in) fell. Bulawayo has good-quality tap water owing to the management of the water authorities, meeting international standards. Bulawayo does not recycle waste water but uses treated waste water for irrigation. Bulawayo experiences water shortages in drought seasons due to the overwhelming increase in population versus the static and sometimes decreasing capacity of the reserve dams. The geographical factors causing water scarcity are rising temperatures, the area's high elevation and the arid environment of Matabeleland. Bulawayo provides residents with water by using a system of dams, treatment plants, and reservoirs. Environmental and sanitation circumstances have detrimental effects on water quality. Sources such as groundwater and tap water are subject to pollution due to waste from burst sewers contaminating them. Samples taken from well water from the Pumula and Robert Sinyoka suburbs show that well water maintain levels of coliform higher than the Standards Association of Zimbabwe and World Health Organization give. The population of Bulawayo, according to the 2012 national census, stood at 653,337; however, this figure has been rejected by the Bulawayo City Council authority with Councillor Martin Moyo claiming an anti-Bulawayo conspiracy to under-fund projects in the city. The population of the city according to metropolitan council sources is closer to 1.5 million and a more closer and estimated figure being 1.2 million. Reports have alluded to the de-industrialization of the city as the reason for its population decline, a claim which was rubbished as council officials referred to the fact that, in 1992 the city's population stood at 620,936. It had grown in the number of households due to urban expansion. City authorities also laid claim to the fact that the current water challenges facing the city were a result of an increasing population despite its economic challenges. Bulawayo was known as the industrial hub of Zimbabwe. This has led to the Zimbabwe International Trade Fair being hosted in Bulawayo. It had a large manufacturing presence with large industries based here before Zimbabwe's economic collapse. However, some of these companies have either moved operations to Harare or have closed down — which has crippled Bulawayo's economy. Most factories are deserted and the infrastructure has since been left to deteriorate. The reason for the de-industrialization has largely been political, with some factories like Goldstar Sugars removing machinery to open new factories in Harare. When the Zimbabwean government passed indigenisation laws, some successful businesses were taken over by ZANU-PF supporters, only to close down a fews years later. Many locals argue that it is because of marginalisation they experience against the government due to cultural differences between the Shona in Harare and the Ndebele in Bulawayo because the National railways of Zimbabwe (headquarters in Bulawayo) is a government parastatal and, as such, should have been thriving had it not been for embezzlement of funds by company executives who are believed to be Shona. The water issue is not new and had brought about the "help a thirsty Matabele" initiative of the 1970s and the Matabeleland Zambezi Water Project which would put an end to the water issue in Matabeleland was drafted; however, this project was put on hold soon after independence. These allegations have all been labeled hogwash by the relevant authorities. However, they have only fueled the secessionist initiative into a general opinion. The city still contains most of what remains of Zimbabwe's heavy industry and food processing capability. This includes a thermal power station that resumed operations in February 2011 after a capitalisation deal with the Government of Botswana where Bulawayo would supply 45 megawatts in three years. Like many parts of the country, Bulawayo has for the past ten years[when?] seen a huge drop in service delivery and an increase in unemployment due to the resignations of people seeking better prospects across the border. Many people resorted to farming, mining, and the black market for sustenance, while others depended on the little foreign currency that would be sent by family in other countries. However, with the introduction of the multi-currency system in 2009, a new approach is seen by investors in the city who admire the already-available infrastructure; the huge workforce; and Bulawayo as great prospects. It is set to once again contribute greatly to the economy of Zimbabwe. The city is served by Joshua Mqabuko Nkomo International Airport and the other international airport in the region being the Victoria Falls International Airport. Bulawayo is the capital of the bigger Matabeleland province which is arguable Zimbabwe's tourism paradise. Matabeleland boosts of Victoria Falls, Matopo National Park, Hwange National Park, Khami Ruins and a bigger share of Lake Kariba. The city is located within an excellent road and rail transport network linking the region to South Africa, Botswana, Zambia and Mozambique. 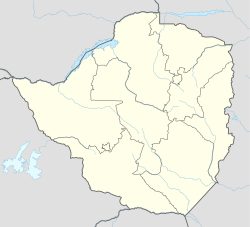 Bulawayo is governed by the Bulawayo City Council, which is headed by the Mayor of Bulawayo. Although controlled by the main opposition party MDC-T, the council has managed to stand out as the leading municipality in Zimbabwe in service delivery to its residents, through campaigns engineered by the city council such as the #mycitymypride campaign and #keepbyoclean on social media. These have been met with positive responses by residents and other stakeholders in the city. In recent years, Bulawayo has been widely perceived as the cleanest city in Zimbabwe due to the council's effective waste management strategy. In 2015 the city of Bulawayo was praised for its town planning that, unlike major urban areas such as Harare and Chitungwiza, has not been marred by corruption and problems such as illegal settlements. Bulawayo has museums of national importance, including the Natural History Museum of Zimbabwe, National Gallery, Bulawayo and the Bulawayo Railway Museum. Bulawayo is home to the Queens Sports Club and Bulawayo Athletic Club, two of the three grounds in Zimbabwe where test match cricket has been played. Bulawayo Golf Club, the first golf club in the city and country was established in 1895. The Matsheumhlope Stream cuts through the 18 hole course in the suburbs. It is home to Hartsfield Rugby grounds where many international Test matches have been played. Hartsfield was developed by Reg Hart, after whom the grounds were named and on which field many of southern Africa's greatest rugby players have competed. It is home to two large football teams: Highlanders and Zimbabwe Saints. Other football teams include Bantu Rovers, Chicken Inn, How Mine, Quelaton, and Bulawayo City (R). The city has a total road network of about 2100 kilometres; 70 percent was declared in 2017 in a poor condition. The R2 road links Bulawayo with the Capital Harare. The city has Bulawayo Station on the Harare-Gaborone main line and the Beitbridge Bulawayo Railway. On the 1 November 2013, a new terminal of Joshua Mqabuko Nkomo International Airport, formerly known as Bulawayo Airport, was opened. Bulawayo is home to a large number of hospitals and other medical facilities. The United Bulawayo Hospitals, a public hospital network, operates Bulawayo Central Hospital, Richard Morris Hospital, Lady Rodwell Maternity Hospital, and Robbie Gibson Infectious Diseases Hospital. Mpilo Central Hospital, is the largest hospital in Bulawayo, and the second-largest in Zimbabwe, and features a nursing school and midwifery school on its campus. Bulawayo is also home to Ingutsheni Hospital, which at 700 beds is the largest psychiatric hospital in Zimbabwe. Other hospitals in Bulawayo include All Saints Children's Hospital, Hillside Hospital, Mater Dei Hospital, the Nervous Disorders Hospital, St Francis Hospital, and Thorngrove Isolation Hospital. In Bulawayo, there are 128 primary and 48 secondary schools. Bulawayo is home to a number of colleges and universities. The National University of Science and Technology, the second-oldest university in Zimbabwe, was established in Bulawayo in 1991. Solusi University, a Seventh-day Adventist institution established in Bulawayo in 1894, gained university status in 1994. Additionally, the University of Zimbabwe and the Catholic University of Zimbabwe, both based in Harare, operate satellite campuses in Bulawayo. Bulawayo is home to a number of institutes of technology and vocational colleges, including Bulawayo Polytechnic College, Speciss College, and the Zimbabwe School of Mines, among others. The city is also home to several teachers' colleges, including the Blended Education College of Southern Africa, Hillside Teachers' College, and the United College of Education. The Chronicle, a state-owned daily newspaper, and its Sunday edition, The Sunday News, are published in Bulawayo. The Chronicle is the second-oldest newspaper in Zimbabwe, and along with The Herald, published in Harare, it is one of two major state-owned newspapers in the country. UMthunywa, a state-owned Ndebele-language newspaper, is also published in Bulawayo, where the majority of the population belongs to the Ndebele people. Private online publications like Bulawayo24 News and B-Metro are also based in Bulawayo. ^ A.R.C.B. (1961). "Review: A Russian Look at Rhodesia". The Journal of African History. 2 (1): 161–162. doi:10.1017/s0021853700002279. ^ "D.S.O." London Gazette. 19 April 1901. Retrieved 24 November 2013. ^ "Industrial empire Bulawayo reduced to a ghost town". mg.co.za. Retrieved 30 July 2014. ^ "isiNdebele for beginners. Northern Ndebele language in Africa". www.northernndebele.blogspot.com. ^ "Scottish Place Names - Bulawayo, Zimbabwe". www.rampantscotland.com. Retrieved 10 April 2019. ^ Technologies, Numo Uno. "Bulawayo 1872.com :::: Southern African home". www.bulawayo1872.com. ^ "Scottish Place Names - Bulawayo, Zimbabwe". www.rampantscotland.com. ^ "World Weather Information Service – Bulawayo". World Meteorological Organization. Retrieved 25 October 2015. ^ "Bulawayo Airport Climate Normals 1961–1990". National Oceanic and Atmospheric Administration. Retrieved 10 June 2016. ^ "Klimatafel von Bulawayo (Goetz-Observatorium) / Simbabwe" (PDF). Baseline climate means (1961–1990) from stations all over the world (in German). Deutscher Wetterdienst. Retrieved 13 May 2016. ^ Nyemba, Anesu; Manzungu, Emmanuel (2010). "The impact of water scarcity on environmental health in selected residential areas in Bulawayo City, Zimbabwe". Physics and Chemistry of the Earth, Parts A/B/C. 35 (13–14): 823–827. doi:10.1016/j.pce.2010.07.028. Retrieved 11 November 2016. ^ Nyemba, Anesu. "The impact of water scarcity on environmental health in selected residential areas in Bulawayo City, Zimbabwe." Physics and chemistry of the earth 35.13 (2010):823–827. Web. ^ "Provincial Report – Bulawayo" (PDF). Archived from the original (PDF) on 9 September 2015. Retrieved 4 May 2016. ^ "Bulawayo Census Outrage". chronicle.co.zw. Retrieved 4 May 2016. ^ "Storm Over Bulawayo Census Results". thestandard.co.zw. Retrieved 4 May 2016. ^ "70% of Bulawayo roads dilapidated". bulawayo24.com. 12 February 2017. Retrieved 17 May 2017. ^ "Joshua Mqabuko Nkomo International Airport opens". bulawayo24.com. 2 November 2013. Retrieved 17 May 2017. ^ "About Us". United Bulawayo Hospitals. Retrieved 27 February 2019. ^ Makoni, Albert (6 September 2007). "Health disaster looms in Bulawayo". The Zimbabwe Guardian. Archived from the original on 26 December 2007. Retrieved 22 November 2007. ^ Shizha, Edward; Kariwo, Michael T. (2012). Education and Development in Zimbabwe. Springer Science & Business Media. p. 10. ISBN 9789460916069. ^ "First private teachers' college opens doors". Bulawayo24 News. 17 February 2019. Retrieved 27 February 2019. ^ "Twin City of Aberdeen Stavanger Norway". About Aberdeen. Retrieved 26 February 2019. ^ "Sister Cities". www.durban.gov.za. Retrieved 26 February 2019. ^ a b "Bulawayo Engages Australia For Economic Development". ZimEye. 2 December 2018. Retrieved 26 February 2019. Wikimedia Commons has media related to Bulawayo. Wikivoyage has a travel guide for Bulawayo.